Are you ready for the battle for the North Pole? 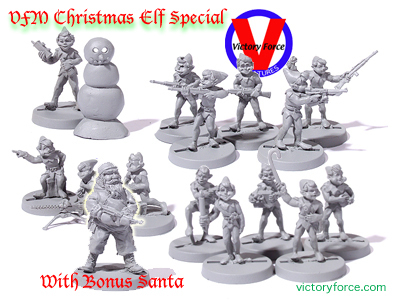 Get The VFM Christmas Elves Half Squad, MG Team, FO pack and the Unarmed Elves pack along with a Bonus Santa armed with submachine gun. Find the Special in the Specials Section of the Victory Store. Other Elves along with other Storybook Wars figures available in the Storybook Wars section of the Victory Store. Subject to end without notice. Not available with other offers and coupon codes. Must choose Special to get special price. © 2012 – 2013, JLB Studios LLC. All rights reserved.